Belly casting is a 3D sculpture of your pregnant belly designed to preserve your beautiful pregnancy shape for a lifetime. We can even customize your belly casting with a design or decoration. Many parents share their belly casting with their child has he/she matures. The ideal time to conduct belly casting is between 34 and 38 weeks. 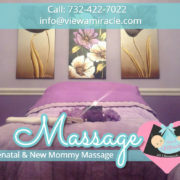 Have questions about maternity photography, belly casting, prenatal massage or any of the other services we offer? If so, give us a call. We look forward to helping you make the most of this beautiful time. Our East Brunswick, New Jersey location is open seven days a week for your convenience.